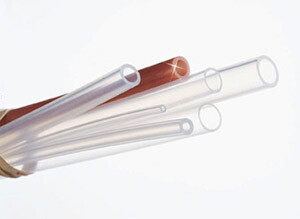 PFA tubing is a flexible tubing with an almost transparent appearance. Unlike pipe, PFA tubing can be extruded in very long, continuous lengths, thus allowing fewer connections. PFA tubing from OMEGA is manufactured using the highest grade resins, which provide outstanding physical- and chemical-stress crack resistance and the greatest flex-life. Like pipe, PFA tubing has excellent chemical resistance properties and can be used in temperatures ranging from -196 to 260°C (-320 to 500°F). 참고: *Specifications given are typical. Field testing is recommended to find the actual operating specifications in the given application. Notes: PFA is clear in color and can be heat sealed and heat bonded. Sold in standard coil lengths of 25, 50, and 100 ft. PFA packages have no splices. Consult Sales for available non-standard colors.